– You have been a member in numerous musical projects, from Keren Ann to Angels of Light, through your band – Bee and Flower, and here you are with your solo project, beautifully named “Insect Ark”. I am listening to your music and I am wondering – Do you approach the music in Insect Ark as a chance to explore and experiment, or maybe as a chance to just do your music without having to answer to anyone else? – (Dana Schechter) It is definitely a chance to be without barriers. Experimentation is one of the main freedoms of working alone. I love song form but I also love the open spaces of less traditionally structured compositions. i give free reign to my internal muse. – One more question about your other projects, past and present: How do you define your own space, your own freedom of action, within the confined walls of other projects? Is it the same expression of the self that you find working with Keren Ann or with Michael Gira, or in your own band? 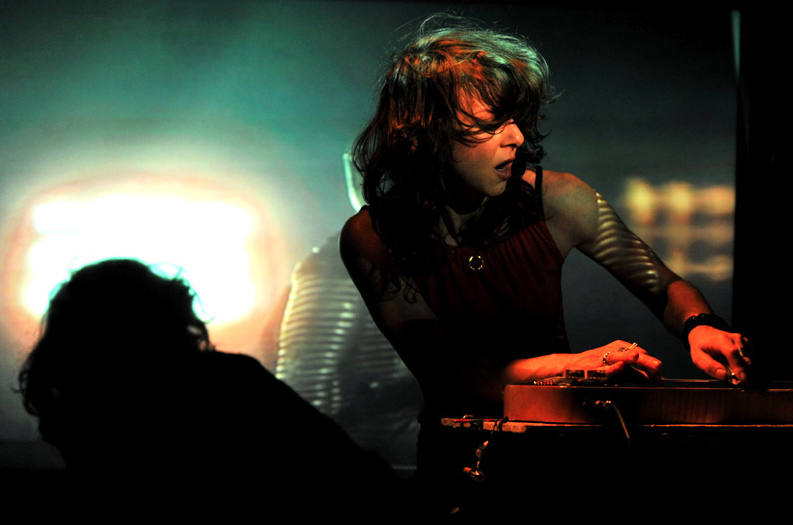 – Insect Ark, being a solo act, brings about various challenges, but also many freedoms. In a band, to make it work you need to function as one part of a whole. Within your role, everyone makes contributions with their own style of playing – as an instrumentalist, contributing writer, etc. When I was working as a bassist with Keren Ann or Michael Gira, no, it wasn’t the same as being a member in my own band (Bee and Flower), since I am the principal writer in Bee and Flower, my connection to it is inherently different. – When I listen to the album, I see the three tracks of ‘Long arms’ as three separate stories. How do you approach the writing of new music for Insect Ark in the first place? Is there a specific conceptual or musical idea behind each track that sets it into motion? – As far as ideas and inspirations go – it always varies. I often start with a melody, chord progression, or a rhythmic part. I stack layers then I start removing, boiling it down to the essence. Since my goal is to be able to perform these songs alone in a live setting, it’s a process of building, breaking down, and reformatting the songs until they feel done. – What is the appeal that you find in the genre of music that you play in Insect Ark? Why is it this sort of music and not something else? – I enjoy the power and aggression as well as the subtlety and dynamics. When writing, the sounds and moods reveal themselves to me – it’s sort of like they birth themselves…i often toss ideas away, but if they make it through the morass, I don’t doubt or judge them. – Being an animator, you obviously find a common link between visual art and presentation and sound, or music. How does this come to realization? Do you make specific, original music to your animation works? Do you perform with videos or other visuals on your shows? – I’ve just completed an animation called “Ocular Wheel” for a group art exhibit called “My Icon” at Gallery Neurotitan in Berlin – I did the filming, music, animation etc. It was fun, and I’d do more short format animations if I had more free time. I’ve used live visuals a little bit, but only with other’s imagery; early next year I’ll start working on my own visuals for my concerts. When its done well, it can make for an extremely powerful live experience – full immersion. – From your experience, do you see any interaction between the world of visual arts and the world of music? Do you think there is a place for challenging music in galleries and museums? – Yes, and I’d like to see much more of this interaction. This is actually a goal of mine – to present an audio-visual performance in a proper museum or gallery space; I think audiences are starved for new experiences and new ways to experience these types of medias. – Are there any non musical influences on your music in Insect Ark? – Being a human on earth, and everything we experience on our journey influences me. There is no separation. – Om, The Oscillation, Eagle Twin, Mark Lanegan, Boban Markovic Orkestar, Swans, And the Wiremen, Nadja, Berliner Ring, Evangalista, Pink Floyd….